Female Barrow's Goldeneye, Wrangell - St. Elias National Park, Alaska. Female Barrow’s Goldeneye, Wrangell – St. Elias National Park, Alaska. 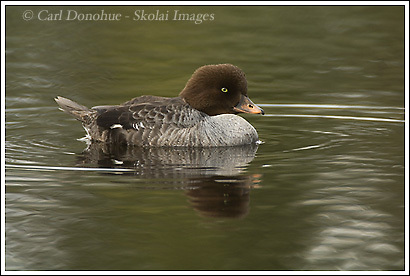 Here’s the female of the 2 Barrow’s Goldeneye ducks I photographed recently. I couldn’t have asked for a more co-operative pair. They were surprisingly tolerant. I didn’t have a blind setup or anything, just slowly and gingerly made my way around the pond, through the woods, hid behind a small bush, and waited for a few hours, and they gradually started coming over my way from time to time, where I could get some images. It’s wild to see the different between the male and the female of the species. The male of the species, in breeding plumage, is way sharper looking than the drab female. This is pretty common in numerous species, but particularly birds. That is one heck of a photo. The colors surrounding her are perfect! Professional work as always!! You can definately tell the difference between the male & female plumage!